Location: 42, Tole Bi Str. 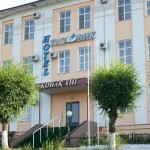 Description: Hotel “An-Nel” is located in the southwest city of Taraz. Facilities include comfortable rooms of European standards. The hotel is located in a quiet area in the vicinity of shops and cafes, the city market. Description: Modern design of hotel “Gazovik”, made in European style. Autonomous heating and hot water, satellite television, a variety of services and service attributes hotel “Gazovik” to the category of elite. Description: Hotel “Taraz” is located near the city center at one of the main streets, bearing the name of the national bard Zhambyl Zhabayev. In the façade and the interior of the building of hotel “Taraz” used in traditional southern Kazakhstan motives.